Mother-Daughter Nia | Fit Families | Kids VT - small people, big ideas! We lived in Brooklyn when my oldest daughter, Dahlia, was born. She was about 8 weeks old when I brought her to our first mother-baby Pilates class. I desperately wanted to get some exercise but was terrified that she'd wake up and scream. She did, but I continued to go, because the mental benefits of getting out of the house and being around other mothers was worth it. On a Sunday afternoon earlier this winter, I felt that familiar desperate need for exercise — perhaps more so now that 11-year-old Dahlia has three siblings. Again I chose to bring my oldest with me — not out of necessity this time, but because I thought it might be fun. Our destination was South End Studio in Burlington, which offers mother-daughter Nia classes a couple of times a year. I'd taken Nia classes there a few years ago and was eager to return. Dahlia, on the other hand, was confused. "What is Nia?" she asked when I told her the plan. Before I could explain, she said, "Wait! I know what it is!" The previous week, Sabrina Gibson, owner of South End Studio, had led a Nia routine in Dahlia's PE class at Edmunds Middle School. The name Nia (pronounced NEE-ah) is an abbreviation for "nonimpact aerobics." The dance-cardio-fitness routines comprise 52 basic movements and techniques that combine a wide variety of dance styles and body/mind healing arts including Feldenkrais and the Alexander Technique. Classes are done barefoot to a wide range of music and follow a distinct pattern: warm-up, sustained nonimpact aerobic conditioning, strength training, cooldown, stretches. Nine girls and six moms attended our session. We began in a circle, facing each other. Like in yoga class, we set an intent for our workout. Mine was simple: I wanted to enjoy working out with my daughter. The excitement in the room gave me the sense that we were about to embark on something meaningful. "Does it matter if you don't get all the steps?" asked the energetic, curly-haired Gibson as we found our spots on the shiny studio floor. The girls shook their heads — a few of them were taking Gibson's after-school Nia class series for girls. Gibson later explained that Nia is unique because within the choreographed steps "there is freedom to move your own way," which "takes the pressure off having to do the steps right or having to look a particular way doing them." Most important is that you move your body and have fun, she said. She pumped up the music, and we began our warm-up, lifting our arms and legs as we moved back and forth across the floor. We jumped, danced and slid around the studio to pop songs like "Shake It Off" and "Uptown Funk," trying to keep up. With our feet doing the cha-cha and our arms punching like boxers, the girl power was flowing. After a couple of high-intensity songs, Gibson let us catch our breath with some calmer world music. Hadley Bunting and her 8-year-old daughter, Abernathy, wanted the shared experience of trying something that Bunting said was "outside our comfort zone." Abernathy described the class as "relaxing" and enjoyed the mix of choreographed and free-dance pieces that let participants move to their own rhythm. "There is something special about a room full of mothers and daughters," Bunting said. As I watched Dahlia express herself physically in a safe, comfortable space, I felt the same way. We could both be playful, let loose and be free from a new and sometimes tense dynamic as adolescence approaches. This class was a great way to do things our own way, together in the same space. By the end of the 55-minute class, everyone was sweaty and red-faced. Gibson brought the energy down with yoga-style stretches and led awareness back to our breath. We ended in a circle, where Gibson reminded us of our initial intents, and we had a moment to meet eyes with our fellow classmates in appreciation. I took Dahlia's hand, and we stepped out of the studio feeling sweatier — and more connected — than when we stepped in. 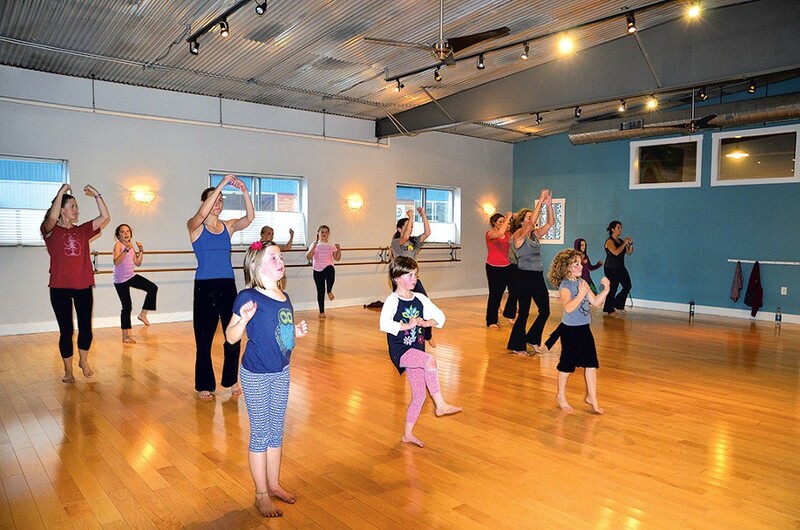 South End Studio (696 Pine Street, Burlington) offers 55-minute mother/daughter Nia classes several times a year for $15 per person, as well as adult Nia classes seven days a week.